Staff Photo by Allison Kwesell Tyler Morgan, network engineer with EPB's information technology, right, and James Dunn, field engineer with Tantalus Systems Corporation, check the variation of network communication between EPB's test lab and it's data center at EPB. At age 83, Charles Beamon would appear to be an unlikely pioneer in solving America's energy problems. But the Vance Road homeowner is among the first in Chattanooga with a so-called smart electric meter that gives him and his power provider -- Chattanooga's EPB -- continuous feedback on his home's energy consumption. Mr. Beamon says he hasn't noticed any change in the comfort of his home since the smart meter and the programmable thermostat from EPB were installed a year ago. But he does enjoy cheaper monthly electric bills. "My electric bill in June was only $31 and only $28 in May," he said. "I'd say it's working out pretty well." With such favorable feedback from most of the 32 participants in EPB's pilot EnergySense program, EPB will begin next week installing 1,000 more of its smart meters under its time-of-day pricing option. Such devices and pricing methods continuously measure how much power is being consumed and set the electricity rate at a higher cost when it is most in demand and the most expensive to produce. On Thursday, the Tennessee Valley Authority and 20 of its distributors initiated a request for assistance from the federal government to help pay for similar smart grid technologies across the utility's seven-state region. Under time-of-day prices, consumers who limit power consumption on hot summer afternoons or cold winter mornings could get a break. Those who use more power when most others do could end up paying more. "If we make people aware of the electricity they consume and use time-of-day pricing to discourage consumption during peak demand periods, we think we can promote more energy efficiency and help the customer and us save money," EPB Senior Vice President David Wade said. The typical residential customer in the program saved about $50 over the past year, EPB spokeswoman Lacie Newton said. EPB's smart grid is part of a $220 million fiber-optic network being deployed across Chattanooga in the next year by the city-owned utility. Once the system is fully installed -- estimated to take about three years -- EPB will have the largest municipally owned fiber-optic system in America. EPB hopes to recoup its investment primarily from not having to continue to manually read its 160,000 meters, cutting the theft of power from altered older-design meters and generating extra revenues from new video and telecommunications services made possible by the fiber-optic network. Within the next year, EPB is preparing to launch its fiber-optic video and phone service throughout the cities of Chattanooga, Red Bank and East Ridge to compete with Comcast cable and other cable and video services. EPB officials also insist the fiber-optic network will improve both electric reliability and video and telecom competition in Chattanooga. Other distributors in the Tennessee Valley are more reluctant about such hefty investments in new technologies, and some are wary about lower sales and profit margins from time-of-day pricing, officials said. "There are some distributors that embrace the idea, and there are others that are not as excited about it," said Philliip Burgess, communications and government affairs manager for the Tennessee Valley Public Power Association, the Chattanooga-based trade group of TVA distributors. "We've been working with TVA for a number of months, and I think we'll see some new pricing options in the future." Paying for the new equipment remains a challenge. EPB is spending an average of $117 per meter on equipment and installation, beyond the expense of stringing about 3,000 miles of its fiber-optic wires. 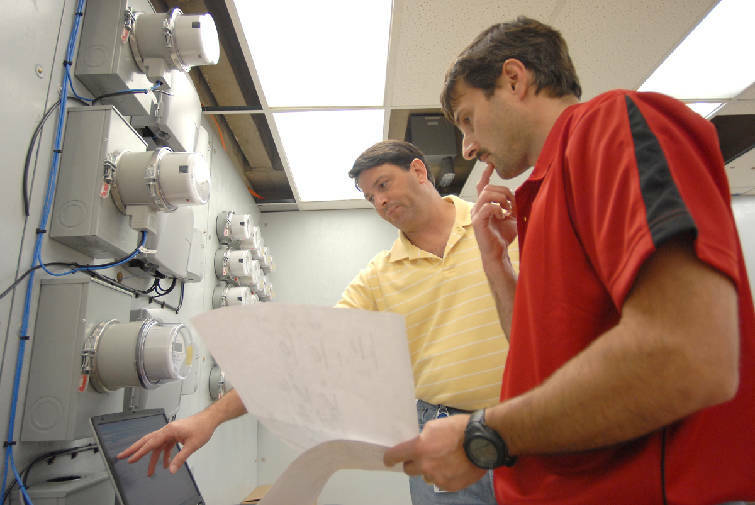 Utilities are being given some help with the purchase of smart meters and other smart grid transmission and control devices through the federal stimulus law adopted by Congress in February. Such money is due to be distributed this fall and the federal government has begun receiving preliminary applications for the assistance. Mike Ingram, senior vice president of demand response for TVA, said a consortium of distributors and TVA filed a letter of intent Thursday to solicit part of $3.4 billion set aside for utilities to improve transmission and distribution facilities to spur more efficient use of electricity. Smart grid technologies bring the Internet and its interactive communication capabilities to power delivery, allowing better pricing and control of how electricity is distributed and used. TVA also is working with the Tennessee Valley Public Power Association's contracts committee on details of a time-of-day pricing plan. TVA now charges a flat rate for its electricity, regardless of when it is used or how much it costs at different times of the day to buy or produce. Combined with programmable thermostats or controllable water heaters and appliances, smart grid technologies also can limit unneeded energy consumption and redirect power usage to periods of the day when demand is lower. "We're at the beginning of a major transformation in how electricity is used and distributed," said Stephen Smith, executive director for the Southern Alliance for Clean Energy. "Real-time pricing of electricity is very important and long overdue to send the right price signals to consumers and hopefully encourage wiser and more efficient use of power." Dr. Smith likens the smart meter to a fuel gauge on an automobile that provides continuous information to consumers about how much fuel or energy is being consumed. "You might get as much as a 15 to 30 percent drop in consumption if we fully develop the technologies of a smart grid," he said.